Eat it now or it will soon turn into an inedible mass that you'll need to dip in your coffee to soften enough for consumption. Those are the thoughts that flash through my mind when I think of scones. So I rarely make them... unless I can eat them now or serve them soon after removing from the oven. 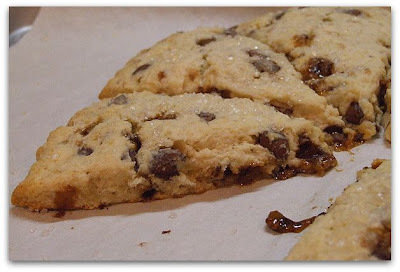 This recipe for Chocolate Chip- Toffee Scones was calling out to me... "Try me! I won't be like the rest! 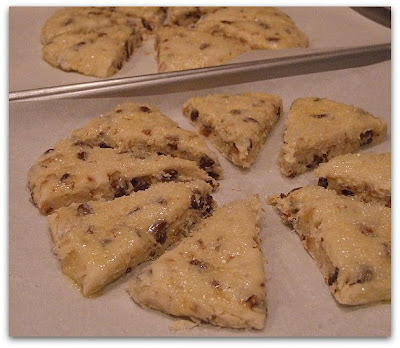 I'll be the best scone you've ever had!" How could I possibly resist that? Side note and/or fact about me: I have some sort of addiction to all recipes that have "toffee" within the title. I guess the thought of noshing on a baked good that has all of those melted toffee bits hiding inside is just too difficult to refuse. See that sneaky bit of toffee oozing out? Heaven! 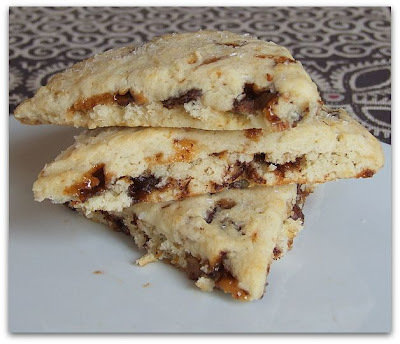 These amazing little scones were anything but dry and crumbly. They were actually even better the following day. 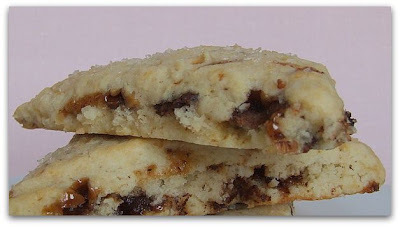 When you let those chocolate chips and gooey bits spend the night buried within their doughy exterior, they manage to fend off the dryness and intensify the flavor. A coating of coarse sugar allows for a sweet bite all around. Best scone I've ever had? Hard to say as I've had a few in my day, but it's definitely among the top three. These were happily consumed and enjoyed. Every last toffee bit.